Happy Easter. It is a glorious sunny day here in Michigan. I worked outdoor in my garden pulling weeds for a while getting it ready for plants next month. Lucky me, the raised beds are just outside of Sadie's range and I was able to work in peace. Not that she was happy about that. I have ho urs and hours or work to do outdoors just to get ready for summer. The snow knocked down a lot of branches that will need to be racked. I think I will challenge myself to spend an hour outdoor each evening after I get home from work raking in the yard. Here is another version of the Easter Egg from Kristen Wind Hansen's Tatted Easter Eggs. 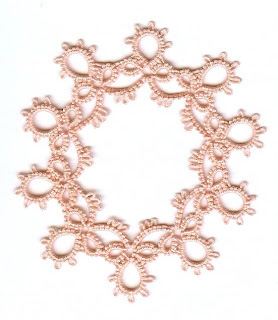 This one was made with Lizbeth Color 630 and it is all front/back side tatting. What a challenge that was as I kept forgetting what I was doing and had to rip out my chains several times. But I did it. and I like it. I have been working on scrapbooking and knitting this past week. Finished my knitting project but still have lots of scrapbooking to do. I even have to order some pictures for the scrapbook must have it completed by July 11 for the family reunion.